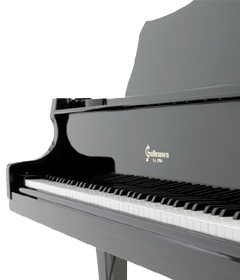 Gulbransen pianos offer the beauty, workmanship and materials one would expect to find in a high quality musical instrument, all at an exceptional value. The Gulbransen grand pianos provide rich, full tones yet are more diminutive in scale and specifically designed for private home use and more restricted spaces. All Gulbransen pianos are available with our without Pianomation®, which maximizes the value and versatility of your purchase by turning your piano into a state-of-the-art entertainment system without compromising your piano's beauty or sound. All pianos come with a matching bench.